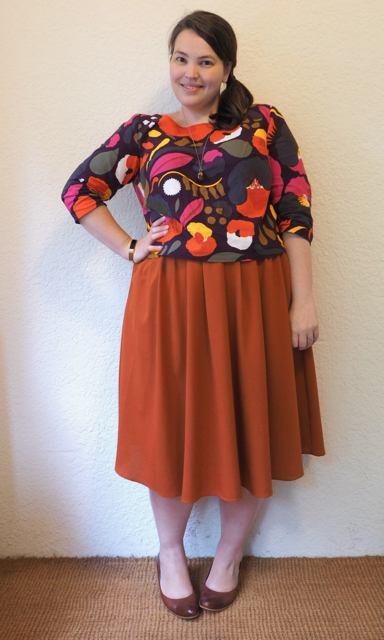 I was paging back through my old posts to see the last time I blogged one of these York tops, and was staggered to discover that I hadn’t yet! Some months ago, a sewing buddy of mine sacrificed one of her Sundays to come over and teach me how to do a full-bust adjustment. I’m still getting the hang of doing them by myself, but the original pattern that she helped me draft – the Seamwork York – has had a very good workout – I’ve made four different versions in a variety of fabrics, including this gorgeous Marimekko linen. 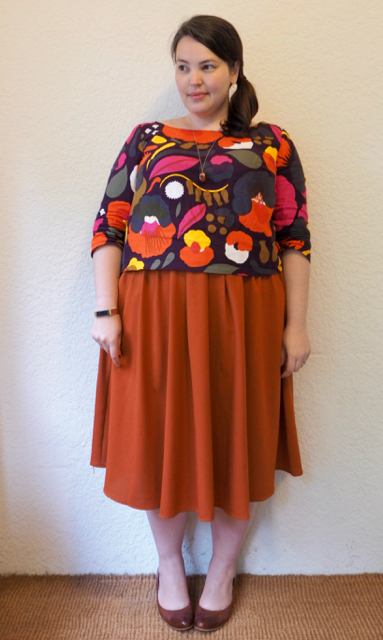 The fabric cost a good $70 which was pretty spendy for yardage, but cheap compared to ready-made Marimekko clothing. I love the bold patterns and colours, and they’re fairly difficult to find in plus sizes or in fabric, so I figured it would be an investment. The York top is designed to be boxy, and normally I would have had to cut a few sizes larger to make sure it fit the Rack of Doom. With a full bust adjustment I can wear the smaller size, and the result is a boxy shape without being swamped. I hemmed it fairly short – partly so I didn’t have to buy so much fabric, but also because I wanted to play up that boxy cropped shape. 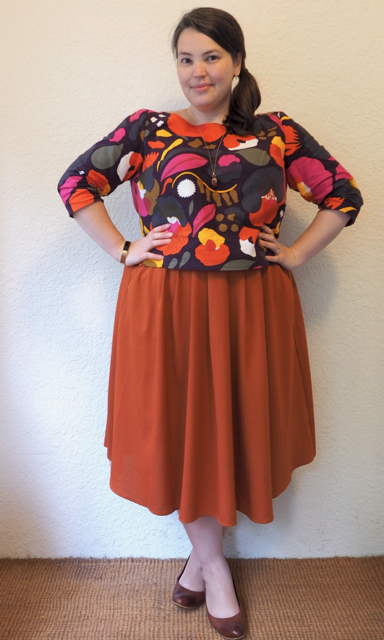 As a result it doesn’t tuck in very well, but I actually quite like how it looks with this full skirt from Modcloth. 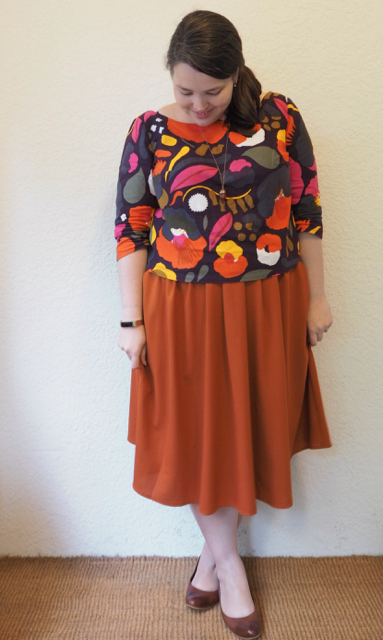 This entry was posted in Uncategorized and tagged blouse, DIY, edward meller, modcloth, skirt, top, warm by lillipilli. Bookmark the permalink. Whoop whoop! I made my wedding dress from Marimekko fabric this summer! It was awesome! Also, I bought the fabric at our local kitchen supply dealer which was an irritating piece of information when people asked me where I got my wedding gown from! Your fabric looks great on you! I love seeing your sewing projects, it inspires me to sew. I actually got my ancient sewing machine out on the weekend (it was a hand me down from my Grandma!) and it went up in a puff of smoke. Now I am in the market for a new machine and just wondered what you use and if you are happy with it – it’s always good to get the opinion of a fellow home sewer. I only need something basic. Thanks!! Great colours and fabric! I’m also interested in the sewing machine you use. I sew on an old Singer treadle which was “electrified” by my mum in the 70’s but I’m thinking of getting rid of the motor and push-down pedal and going back to treadling since reading an article about a designer dude in New York who sews exclusively on treadle Singer machines he finds and refurbishes! I really love your style! I’ve just taken up sewing – I’ve made a couple of basic circle skirts and an apron, so my abilities are still very beginner. I’d love to give this pattern a go. Any tips? I’d love to know where you purchased the Marimekko fabric from? I bought the fabric from a supplier here in Melbourne – Make Design Objects (https://www.makedesignedobjects.com/) – but it’s pretty easy to find online, too. How you do you like the York pattern? I have seen mixed reviews online, but it looks lovely on you!